Bees hum in the lavender. The mint is aggressive and unruly. The tomatoes are plump and still green. The lettuces flop listlessly in the scant shade of their leafy branches. Slugs have chewed holes in the basil. The coriander is fighting for its life. The grass needs cutting and the roses are on holiday. It is August and Paris is sizzling. An unlikely man plays Chopin on a public piano in a Paris railway station. He’s wearing shorts. He’s black and he’s tattooed. 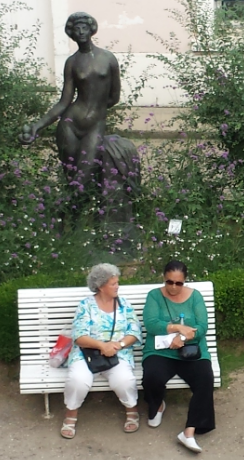 It’s the contrast that catches me unawares. People flop on the beach along the Seine. They are sweaty and ungovernable although probably not Parisian – in August. A girl releases a Chinese tourist from the burden of carrying too much cash. She’s young, dressed in bright colors and the law cannot touch her. My mother remembers her gold chain being wrenched from her neck by two young deeply sun tanned lads in rue de Belleville last year. Fleecing is a popular city sport in summer and it’s multinational. An August orphan parks his car – legally – in the heart of the city. He does this with docility bordering on consideration for others. It is the unexpected behavior that captures my attention. The French president makes handshakes while the sun shines. He wears a tie and his jacket remains buttoned despite the soaring temperatures. Short sleeves and an open neck shirt are not part of the job description but hopefully a good body deodorant is one of the perks. Paris sheds most of its regular inhabitants in August. Its “villages” close their doors for two or three weeks and so if you feel no particular obligation to have your photo taken, your hand shaken or your wallet stolen you can just hum your way through some of the lesser known areas of the town taking pot luck on the air conditioning or sticking to the churches and the gardens rather than the museums. There are four large, astonishing gardens tucked away inside the National Archives building in the heart of the Marais district. What makes them astonishing is their sheer size and tranquility given their location in amongst what remains of the cobbled stone streets of medieval Paris. 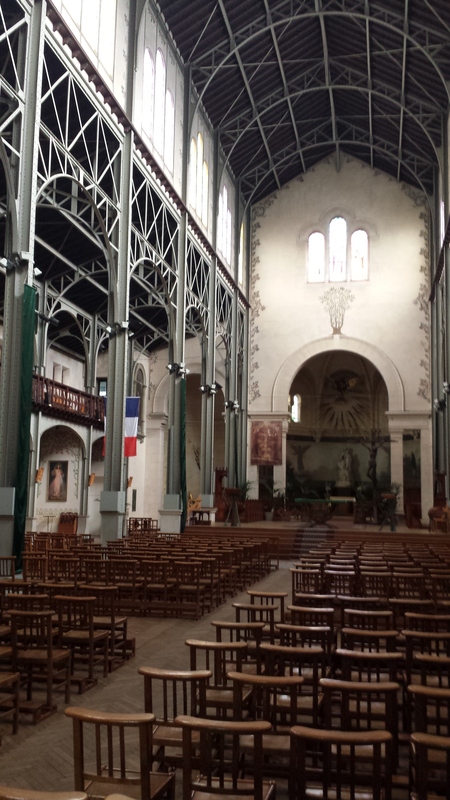 The inside of the church – Notre dame du Travail – in the 14th arrondissement looks like the Eiffel Tower – all girders and lacey metal arches and built for the factory workers of Paris at the beginning of the 20th century. In Balzac’s house in Passy you can see his table where he started work every night at midnight and wrote non-stop until dawn. He was as serious about his coffee as he was his writing but didn’t get past the age of 51. 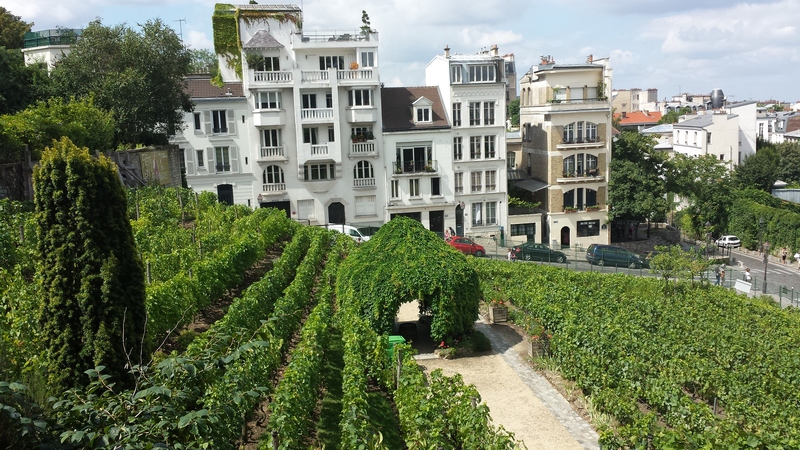 And over in Montmartre, from the garden where Renoir painted his famous lady on a swing, there is a fantastic view over the vineyards of Montmartre. 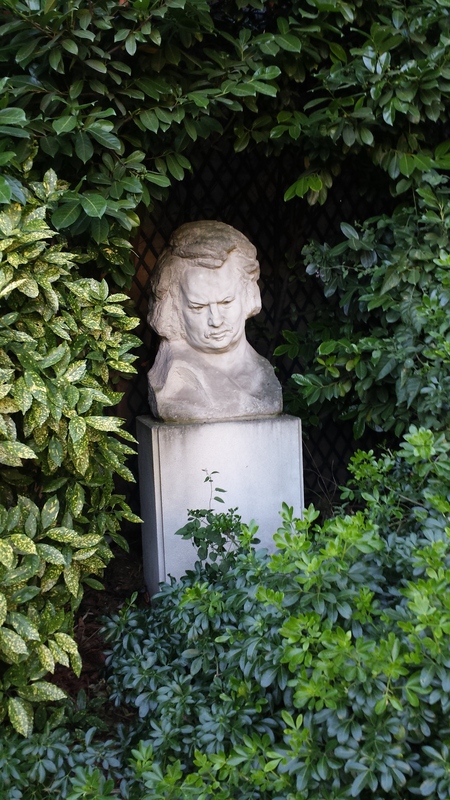 Down the hill and further into the 9th arrondissement there is a tea house in the garden of the Museum of Romantic Life where you can drink tea while imagining Chopin and George Sand holding hands. The basketball player playing Chopin at the railway station is unlikely to fit the backdrop. The five floors of fabrics at the Marché Saint Pierre offer an authentic northern African Parisian experience and, if you can decode the buying process, you might even come away with some delicious tidbits. There are the houses of the rich like the Cognacq-Jays, creators of the huge, now defunct, department store, La Samaritaine whose art collections are open for viewing by the public free of charge and air conditioning. There are the monumental sculptures adorning the multiple spaces at Antoine Bourdelle’s former art studio in Montparnasse to be mused over at the end of the day when the heat is letting up. It costs nothing to idle away the time in a place that the artist moved into at age 24 and was moved out of in a coffin at age 68. And so the summer rolls on, nicely frying people and plants alike, mostly free of charge and full of surprises. So what is the sizzle in your summer about? Oh, and if you are reading this Down Under where the winter is still upon you, just think, it is your turn next and Paris is lovable even “when it drizzles”.